I started drinking coffee out of necessity when I was working third shift to help pay for college, but somewhere along the line I developed a love for the simple taste of it — dark and strong, sweetened with sucanat and a splash of cream, hot in the winter and icy cold in the summer. I’ve got the hot coffee thing down pat, thanks to my Jura Capresso Impressa, but homemade iced coffee has been my nemesis until recently. Like many others, I was under the impression that it was as simple as dumping some leftover extra strong brewed coffee over ice, but I was left with a bitter cup of coffee that quickly became watered down with melted ice. And really it is a super simple process, but the secret to making a great glass of homemade iced coffee is in cold brewing your coffee. Now you might be thinking, “But that will take forever for a glass!” Well, yes, it does take longer to brew, but once you make a big batch, it stores nicely in the refrigerator so you can enjoy a tall glass of iced coffee any time! Start with a good quality strong coffee, like a French roast or espresso. Note that if you use a whole bean coffee, as I did, you’ll need to grind it coarsely for brewing. I used Landmark French Roast Coffee for this batch — I just love the strong, full-bodied flavor. 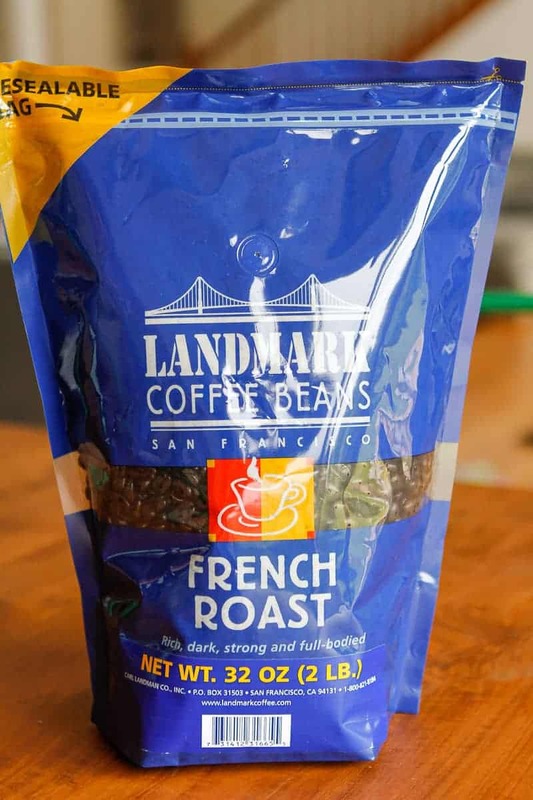 Plus I appreciate that Landmark is a small, family-owned business that believes in producing expert, small batch roasted, high quality coffee. And you can’t beat the price at just $14.78 for a giant 2-lb. bag at Walmart! As I mentioned before, I like a strong cup of coffee, so I mix 1 1/2 cups of coarsely ground Landmark French Roast Coffee with 2 quarts of water, give it a good stir, and let it brew for about 12 hours. 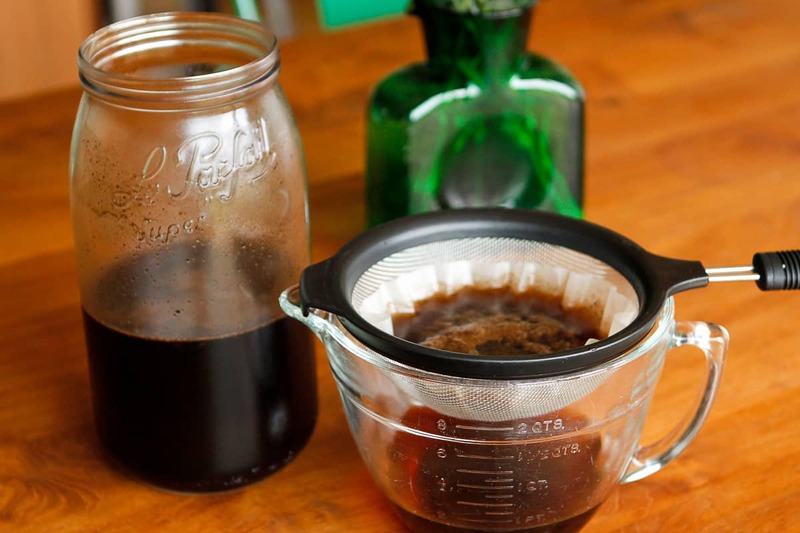 How strong your cold brewed coffee is depends on how much coffee you use and how long you let it brew, so if this is too strong for you, play around with those factors a bit. I should note at this point that I used filtered water for cold brewing because I prefer the taste, but tap water will work just fine! After the designated time has passed, simply filter the mixture through a strainer lined with a coffee filter. You may need to use a spoon to give the mixture a little stir in the strainer every once in awhile. 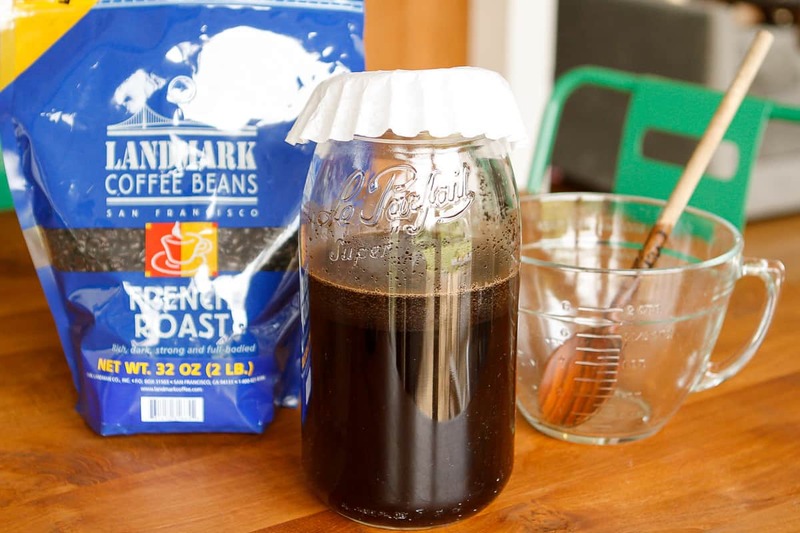 Transfer your cold brewed coffee concentrate to a container that will fit in your refrigerator. I like these Weck carafes, but a large container with a spout at the bottom would be another great choice for easy dispensing. 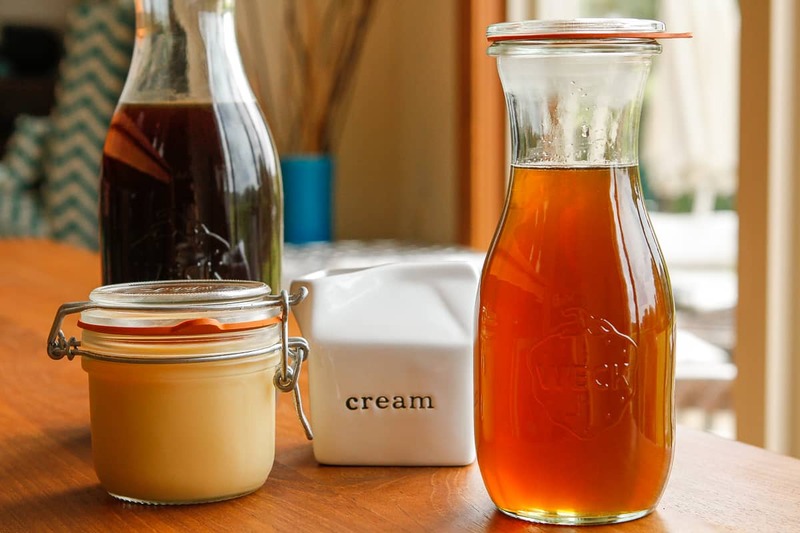 When it comes to sweetening homemade iced coffee, you can certainly just stir in your desired amount of sugar, but stirring granulated sugar into a cold beverage can leave annoying sugar crystals in the bottom of your glass. 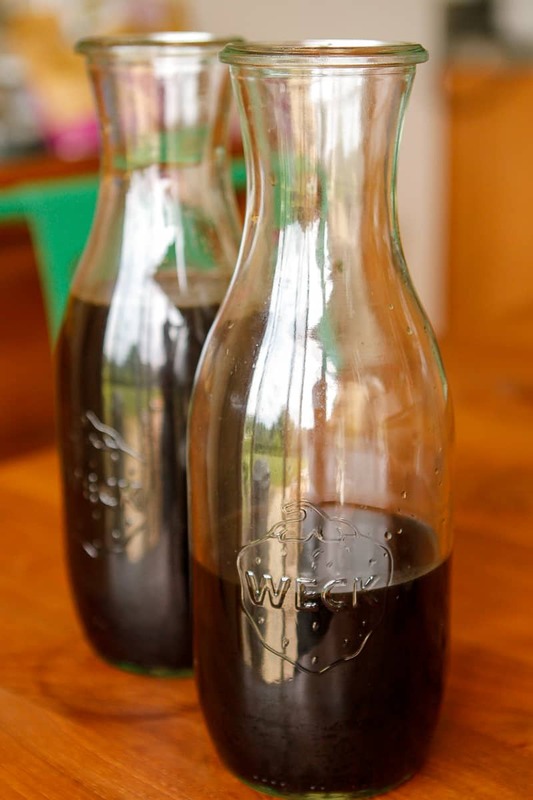 Instead, I recommend making a batch of this double strength simple syrup to stir in. Or you could stir in some sweetened condensed milk for a real decadent treat a la Pioneer Woman. 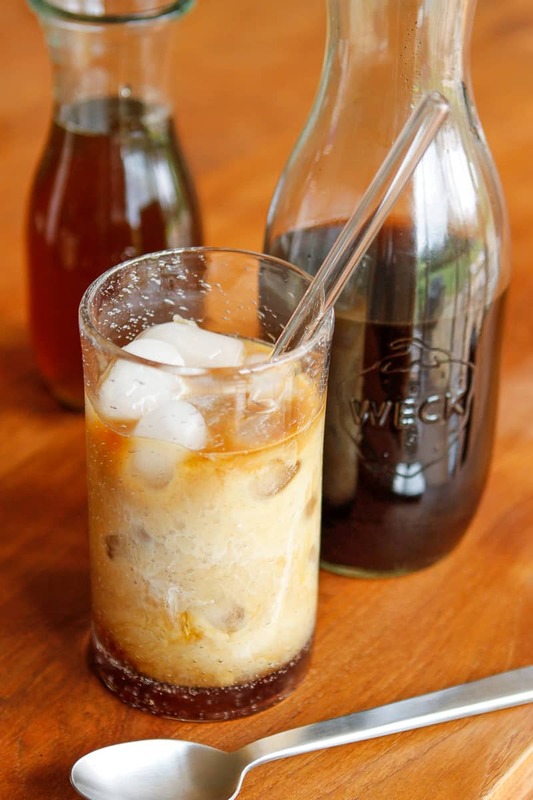 Whichever sweetening method you choose, preparing a perfect glass of homemade iced coffee is easy. Just fill a tall glass with ice (or even better, coffee ice cubes!) and then pour in the cold brewed coffee up to about 3/4 full. Stir in your favorite sweetener, add a splash of half and half, and enjoy! In a large container, stir together coffee and water. Cover and brew for 12-24 hours, to taste. Filter the coffee concentrate through a strainer lined with a coffee filter into a clean container, and refrigerate. Covered and stored in the refrigerator, this cold brewed coffee should last 3-4 weeks. Fill a tall glass with ice (or to keep your iced coffee stronger, coffee ice cubes!) and pour in cold brewed coffee to about 3/4 full. Stir in your favorite sweetener. I like to use this double strength simple syrup for cold beverages. Drizzling in sweetened condensed milk is another decadent option. Add a splash of half and half and enjoy! 1 1/2 cup? carafe? Tblspn? Oops, that would be cups. Thanks for catching that! I am going to have to share this recipe with my daughter. We’re vegan, but she could substitute soy milk and this would be a tasty treat for her. Thanks! I am a total coffee addict, this looks wonderful! I add brown sugar to the ground coffee and water mix before putting in the refrigerator to “brew”. It’s delicious! (and no annoying sugar crystals :) I make this in a 1 qt jar, so it’s 3/4 cup course ground coffee, 1/4 – 1/3 cup brown sugar and 1 quart of water. Thanks for sharing how long it will last. Not knowing how long it would store is why I make small batches. What a great idea! I’ll try this with my next batch. I’m having one of those on my deck right now. Just loverly. Wow… this looks beautiful AND delicious!! Great recipe!